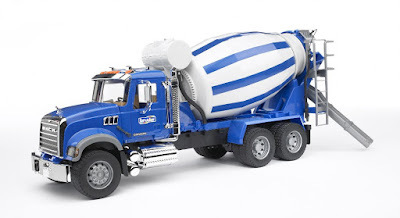 For the last several months, Alex has been saving up his allowance for a Bruder Cement Mixer truck. It's a good toy, made of metal with lots of moving parts. The price tag was $ 100, so he had to save $ 113 to cover the tax. A few weeks ago, he seemed to lose interest in the savings. I discovered why over the holidays: his grandparents had spotted the truck on sale and bought it for him. We found it on a shelf at their house. This was quite a frustrating discovery, more so than it may seem on the surface. Alex doesn't get interested in too many toys. He's just not a particularly acquisitive child. He'd worked very hard on his savings, giving up trips to the Dollar Store, which he enjoys. We were looking forward to counting up his money after the holidays and taking him to finally pick up his truck. Dave and I ended up being up until about 2 am that night, trying to figure out if there was any way to salvage this. We'd used this as an opportunity for delayed gratification, planning and being self-sufficient and independent. After getting his Christmas money, Alex has $ 130. Going into a toy store and being able to just pick something out isn't the same as saving for it. We can't take the money retroactively, especially since there has been such a gap between the truck being bought and discovering it. Alex isn't likely to find something else which interests him as much as the truck (especially since he's gotten tons of presents). Aside from the disappointment of losing this teaching opportunity, there's also the frustration with the lack of communication. We had told his grandparents about the truck and that he was saving for it. We'd even told them we didn't want anyone to buy him the truck for Christmas. If they had contacted us when they saw the truck on sale, then there were a number of options we could have taken, including getting his money and taking him to the store right away. They are sorry for having made the mistake and I know it wasn't deliberate, but it doesn't change the fact that this opportunity is gone and not likely to come again for quite awhile. It was a better than expected holiday, given the number of unusual circumstances. We had both my sisters and their partners up as well as my grandmother from Calgary. There were the usual kerfuffles of scheduling as people asked for last minute changes, etc. And yet, we all got through it and with a minimum of tears and tantrums and family drama on all side. I'll take it as a win. Leaving aside the challenge of getting money to pay for the help families with autism need, there's also a challenge in finding that help. On average, it takes me 2-3 months to train someone to the point of being able to leave them alone with the boys. So all the offers of "just call me to babysit" are nice (and appreciated as support) but aren't actually useful. Often I'll ask those folk for help watching the boys while I'm busy doing something else (such as working or writing or dealing with a major home project). I've discovered this doesn't sit well with a lot of people, so I've had to learn to be careful who I ask. Then there's the challenge of predictability. The boys don't do well with last minute changes, especially if excited. So anyone I ask to work with them needs to be reliable. I've found there are a number of places I can find help: local high schools (I contact the principal to ask them to refer reliable, grounded teens who are looking for part time work), local colleges/universities (two of three higher education organizations offer programs for training workers to work with special needs children, they often want the resume addition), and local boys and girls clubs (such as Scouts), where again, I ask the leaders for suggestions. I have to train these people to work with my boys and the turnover rate can be high. (I'll be lucky if I get a year or more.) But they're more plentiful (and often cheaper) than professional respite programs and workers. I've often referred to Nathan as my "stealth autism" child. He seems to be doing perfectly fine, coping well and then suddenly we hit a roadblock and get reminded that he's got a diagnosis as well. We've been working on having him walk home on his own (or rather, under the supervision of several moms along the way). Alex and I have been meeting him closer and closer to our house as the weeks have gone on. The other day, we saw Nathan running cheerfully towards the house, only a few blocks away. We waved cheerfully and began to walk towards him. Suddenly, Nathan stopped dead and began to scream. Alex and I hurried to find out what the problem was and Nathan ran away, back towards the school. Finally she got him calmed enough that I could sit down with him and get him to talk to me. After a good twenty minutes, we got past the can't-go-home and imminent death threats, to a very simple truth. He had been proud of getting almost all the way home by himself and wanted us to wait for him. Now, the previous week, he had gotten upset when we stopped walking when we saw him. He'd told us to keep coming and meet him. I did try to explain that he can't expect people to just know what he wants. He has to tell us and ask us for what he wants. I'm not sure how much of it sank home. It's something I've told him before and one of the autism-areas we tend to have problems with for him: universal knowledge. He assumes that everyone knows and understands what he's thinking and assumes he understands intentions based on his reactions. (Ie, if he's hurt when someone bumps into him, then they did it on purpose). It was emotionally exhausting and a little worrying. The wild accusations are a very troubling development for two reasons. One, if he told someone who didn't know the family, we could end up under investigation. Two, by using them when they're not true, he makes it less likely that anyone will believe him if someone ever is hurting or threatening him. I'm glad that this time we got it all sorted out without any long term consequences. But it's left me with some worry-fodder for the future. Alex had his physical this week and it turns out he has now grown enough that his medication needs to be increased. The doctor also suggested that we can give him a temporarily higher dose during predictable times of stress (Christmas, end of school, start of school). I always considered medication to be a means of last resort. I still do. I think it's important to try behavioural methods before turning to chemical ones. But sometimes, the medicine is necessary. No one can learn if they feel as if they're constantly under assault or if their brain is always whirling with anxiety. It doesn't matter how good the rewards are, it's just not possible. I have a lot of concerns about Alex being on medication long-term. There are always side effects and those can be significantly different than the ones discovered in the testing process while the drug was being approved. I worry that we've masked the problem and when or if he comes off the medication, we'll discover an even deeper issue. But I won't withhold something which is obviously helping him. A few weeks after starting the meds, Alex calmed down significantly and began to make a lot of progress. It was as if entire stretches of his brain were suddenly available to help him process the world around him. From descriptions I've read of those who've suffered from high anxiety, that may not be far from the case. We've tried reducing the amount once and immediately had behavioural issues again. I'm still hoping that we'll eventually be able to teach him enough that he'll be able to cope with the world without drugs, but I'm also allowing myself to accept that if we can't, that's not an automatically horrible thing. If this is what he needs to be happy and productive, then I will take it. We all compare ourselves with others. It's inevitable. But as Dave and I were comparing notes about the Funfair and saw how different our views of the same events were (he saw it as a disaster, I saw it as a success), it got me thinking about how I need to keep that in mind when I'm talking to other families. There are lots of inspirational stories, especially at this time of year. They usually have the opposite effect on me, because my kids aren't doing as well as the kids in the stories. But who's to say that things are going as well as is being presented. Right after Nathan was diagnosed, we were in a newspaper article on the importance of early identification and intervention for children with autism. As part of the article, it mentioned how Alex, then 5, was in a regular school and playing soccer. It sounded very normal. Of course, most of his day at school was spent in the Quiet Zone because he would get aggressive if any demands were put on him. And his participation in soccer consisted of being on the same field as the other kids and kicking the ball into the woods if it came anywhere near him. Not exactly the success story being painted in the paper. I don't want to diminish Alex's accomplishments or challenges but I've learned how wide a gap the presentation and wording can make. Without saying anything untrue, how something is said can influence a broad range of assumptions. What I need to remember is that other people do that as well. Last weekend, we took the boys to the NAC's Funfair, a free concert where the orchestra plays Christmas songs. I considered it a success, Dave considered it a disaster. We arrived 15 minutes before the concert was due to start. There weren't any seats left so we had to stand. We found a spot relatively near the exit with a clear view of the stage. Alex asked to climb on his grandfather's shoulders and Nathan asked to climb up on mine. Alex stayed up for the first few songs while Nathan wanted down after the first few minutes. Nathan spent most of the concert sitting on the floor behind the chairs, playing with the toys he'd brought. Alex paid close attention when the music was playing but got bored and restless when they were talking. He tried to get us to play with him, swinging him around or letting him play with our phones or climbing on top of shoulders only to wriggle and slide down. I said no to the roughhousing play and no to playing with the phones. I gave him the toys he'd brought to fidget with. At the end of the concert, Alex wanted to ride the elevator and play with the pay phone. There wasn't a phone, but he did get to go up to the balcony level at the NAC and back down again. Those are the facts. What makes it a success or failure depended entirely on our respective expectations. I didn't expect there to be seats available when we arrived. I actually thought it would be preferable to be able to make a quick and discreet exit in case of meltdowns, so I would have chosen to be standing near the doors anyway. Plus it gave the boys more room to wiggle or sit or lay down without disturbing anyone. I didn't expect them to sit quietly and listen to the music. I knew they'd need distractions, which is why I brought the toys. Watching the orchestra isn't necessary, so I didn't object when Nathan wanted to sit on the floor. I knew he'd come up if something caught his attention. I expected Alex to try and push the boundaries, so I set clear ones. No screens, no wandering and no roughhousing. To me, it was a success because we were able to stay through the entire concert and there were no meltdowns. To Dave, it was a disaster because our children were not behaving like the other children there, which he finds disrespectful to the performers and audience. It's true, the boys were mildly disruptive, although not to a point where I would consider it necessary to abort. It goes to show how difficult these kind of judgment calls can be. We're both right in terms of our respective point of views. The case can be argued either way. Our new toileting plan appears to have something going for it. Alex produced twice in the toilet last week, once on Wednesday and once on Friday. And Friday was substantial. He got his rewards both days: Xbox time, unlimited screen time, a McDonald's ice-cream and no more having to sit on the toilet. We've got one more week where we can make this work and then we'll have to take a break for the holidays. I'd like to be more consistent but using the iPad only works if he's producing once a day in a narrow window. If he's home all day, he tends to dribble. Once school starts again, we'll have 5 days a week with a schedule. I don't want to get too optimistic that this is a break-through. We'll need a lot more than twice to actually begin to teach that this is how toileting is supposed to work. (Any child needs between 15 and 30 successes to grasp any skill.) But it's the highest level of success we've had to date and so I will definitely celebrate it. No. Not the movie with Jack Nicholson and Diane Keaton. I'm swamped dealing with Christmas preparations, work stuff, kid stuff and getting my next novel ready for publication. I've been struggling with keeping a balance but there's just too much to deal with. Something's got to give and, this week, it's going to be blogging. My apologies to everyone. I hope you'll still be back next Monday to share in my family's adventures in the wacky world of autism. It's time to try a new phase of the toileting plan for Alex. Now that he is reliably telling us when he has soiled himself and tends to have a single go-time during weekdays, we're going to try pairing screentime and toileting. This is not something which our behavioural therapist recommends in most cases because it usually causes more complications than it helps. Kids can become reflexively triggered to go to the bathroom during any screentime and it's not always an option. In this case, we're trying it because Alex already has a tendency to go when he's got screentime, so we're going to try and transfer it to the toilet. We also have concerns that we're still missing something. We've offered lots of rewards and incentives and in other areas of his life, that's been enough to change his behaviour. In this case, it isn't, so there's something we're missing. I'm thinking that if this doesn't work, it's time to abandon the idea that he will learn to use the toilet in a predictable way. We'll have to consider other strategies like part-time diaper usage and teaching him to clean himself up. Or figure out how to build a standing support so that he can stand and use the toilet. It's frustrating. We've been trying to solve this problem for almost seven years now. We've tried everything we could think of that had the remotest possibility of success. And no luck. A small percentage of kids with autism are never toilet trained. Even if they are very intelligent and socially high-functioning, it limits what they are able to do in life and the supports they can be offered. Most day programs will not accept someone who is not toilet trained and the same for most residential programs. The ones that do tend to have residents who are much lower functioning than average, so they're not great places to be. I was talking with another parent yesterday and they were explaining how their child gets very upset whenever they see another person who is upset or sad or angry. It got me thinking about social cues. My first thought was: why don't I get upset when I see someone crying? I may feel sad. If it's a heart-tugging commercial or poignant situation, I may even have tears well up. But I don't begin to get anxious and sad myself every time I see someone who is upset. So what's the difference? I'm no expert, but I think the difference lies in the social cues. Even as a child, I could look at another child crying and see: are the adults going to comfort him or her? I could distinguish between mad-crying and sad-crying. I could tell if there was something I needed to be upset about as well. There were dozens of cues I could pick up to determine if this situation was something I needed to worry about. Imagine not having that. Every tear is a potential signal of an explosive tantrum. Or a dangerous situation. Without signals to the contrary, it's bewildering and overwhelming. There's no predicting what will happen next and humans do not do well in a state of uncertainty. It's one of the most reliable torture techniques. The state of uncertainty would provoke a lot of tantrums and acting-out as the child desperately tries to make sense. It would encourage them to find artificial means of control, just to reduce the amount of chaos. It makes me wonder how much of the challenges of autism can be boiled down to not being able to pick up social cues? It's something which neurotypical people do so thoroughly that we forget that the signs aren't actually obvious. On the other hand, the signs are there. They can be taught. Even a child can be taught to look for certain telltale signs to help them to interpret what's going on around them. Maybe this is a potential therapy option for kids with autism, something which can be taught early on enough to allow them to proceed in a much less frightening world. I'm not an expert. I don't know if my musings here are old hat, long worn out by autism workers, or if there's actually something to this. I've personally tried (and continue to try) to teach my kids various body language and facial signals so they can interact appropriately. Will it help? I won't know for years, not until they're adults. But it's definitely something interesting to think about. Lately, we've been seeing more and more signs that Alex is more aware socially than he has been before. It's a good sign for his continuing development. Yesterday, he tried to switch the calendar over to December. Unfortunately, the nail holding the calendar up is old and has a tendency to retreat back into the wall under the slightest pressure. So the whole calendar started to come down. Alex immediately got upset and started trying to put it back up. We were busy with another situation and called to him to leave it, that we'd take care of it in a minute. He continued to try and put it back up, getting increasingly frustrated. He tried until we came to help him. A few years ago, he likely would have ditched the calendar as soon as it became a problem. Certainly once he was told that it was okay to walk away. Instead, this time, he seemed to have recognized that he'd caused a problem and was determined to fix it. Now, this isn't definitive. This could also be an example of compulsive behaviour. The calendar should be at December and it's not, and Alex can't/won't rest until it shows the proper time of month. However, we've seen other incidents as well. Each can be explained individually in other ways but the fact that we are starting to see more suggests that maybe he is starting to be more aware of his interactions with other people. Possibly even grasping the idea of reputation, that others can have a particular view of him. We won't know for sure for quite awhile. It's going to take a lot of skeptical observation to build up a case one way or another. This is one of the real challenges I have. People like to be encouraging and seize on these kind of situations as potential breakthroughs. But I always have to err on the side of caution because if I assume he is capable of something which he is not (such as when we thought he was understanding more language than he actually was), then I set him up for failure and frustration. He needs to prove it, not just beyond a reasonable doubt but beyond a shadow of a doubt. I had spoken to Nathan's school to ask if they would be willing to do a fundraiser for Alex's service dog. Initially I got a positive response, but then someone on the council said they couldn't possibly endorse raising money for a student who isn't at the school. I countered that the dog would be of benefit to the whole family, that we don't personally receive any money so it goes to a registered charity. I suggested that even if they weren't comfortable with holding a fundraiser, then perhaps it could be included in the monthly school newsletter, just to let families know it was an option. Today I got the December school newsletters and they're raising money for the local Food Cupboard and Toy Mountain. Those are both worthy causes but I can't help but notice that they probably don't directly affect students at our school. Maybe they're still considering for Alex's dog, and I hope so. But I find the politics of fundraising to be quite frustrating. Actually, I find politics at any level to be frustrating. I'm much happier dealing with groups and individuals who are more focused on getting something done and done properly than in how it might look.